No longer just "Peyton's baby brother" or "Archie's son," Eli Manning has emerged as one of the elite quarterbacks in the NFL. Despite winning a second Super Bowl with the Giants, Eli Manning cards and autographs have been kept in a reasonable territory due to his inconsistent career. Shop for Eli Manning cards and memorabilia on Amazon.com. As a top college quarterback out of the University of Mississippi, Manning was the first pick in the 2004 NFL Draft. Selected by the San Diego Chargers, he was immediately traded to the New York Giants. 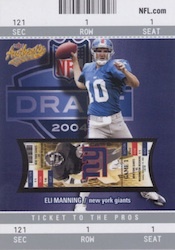 Expectations were huge for the young player, both within the NFL ranks and with Eli Manning card collectors. Although inconsistency has plagued his career, Manning had an amazing run through the 2007 NFL Playoffs. That season resulted in a Super Bowl MVP for Manning as the Giants beat the undefeated New England Patriots. A similar season unfolded in 2011, with the Giants again claiming the title and Manning earning the MVP award. Unfortunately, Manning has not been able to sustain the momentum of his Super Bowl seasons. However, given his history, it seems that he may primed for one more great playoff run. While he will always be compared to his older brother, perhaps unfairly, Eli Manning has planted himself among the top-level of the NFL. Playing under the bright New York spotlight, Manning has seen his share of criticism but he maintains great nationwide exposure and a stable of endorsement deals. Another Super Bowl win would increase his hobby interest exponentially and even set him apart from Peyton, who still only has one Super Bowl victory. Eli Manning has nearly 50 rookie cards, which can be found for as low as a couple of dollars and all the way up to several hundred. The top rookie Eli Manning card options are all autographs. 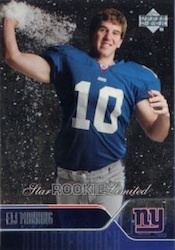 Despite the awkward photo shoot image, the 204 SP Authentic Eli Manning card is a hobby favorite. Featuring a jersey piece, on-card autograph and low print run, the card is a great addition to any collection. 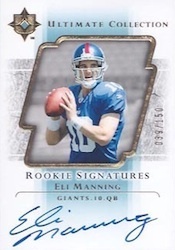 The 2004 Ultimate Collection Eli Manning card boasts a lower print run than the SP Authentic card and also includes an on-card signature. The clean layout has more mainstream appeal and the card should remain a hobby favorite for years to come. This card can easily be summed up in one word: blue. 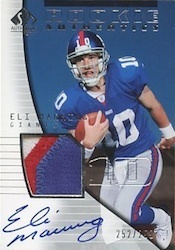 Amazing color variety aside, the 2004 SPx Eli Manning card features a sticker autograph and an x-shaped jersey piece. Although the sticker autograph and higher print run puts the SPx card at a lower level than the Ultimate or SP Authentic rookie cards, it continues to be heavily pursued by collectors. Odell Beckham & Eli Manning NY GIANTS PREMIUM CARD LOT (33) AMAZING LOADED! 2004 UPPER DECK REFLECTIONS ELI MANNING ROOKIE AUTOGRAPH BGS 9.5 10 Auto RARE!!! ELI MANNING Philip Rivers 2004 Ultimate Rookie RC Dual Jersey #'d 99 BGS 9.5 !! Below you will find an example of what Eli Manning's authentic signature looks like. This can be used as a first point of reference for determining the legitimacy of autograph memorabilia, but is not substitute for having your items authenticated by a wellrespected professional autograph authentication company. I have an Ole Miss football signed by Eli Manning and the majority of the Ole Miss football team How do i find out an a appraisal price for it? I have an Eli Manning Lucky 13 Fleer card (278/500). Worth anything?